Still no update despite the confirmation that the 112 will NOT now be extended to Osterley as per the Crossrail bus routes consultation. TfL have a very vague (as usual) in response that this is in response to ‘stakeholder’ feedback and many on here I suspect seem to translate this into “we got this idea wrong, the route would become less reliable” despite their denials about just that. You’d think then that they could effectively have killed two birds with one stone by getting this one published as well considering it’s exactly TWENTY-TWO months tomorrow since the Madeley Road consultation opened and almost 20 since it closed. I think that snoggle may have been right about them brushing this one under the carpet very quietly because in reality it’s not a very complex consultation. What do we all make of the delay in the outcome? Do you think that the suspension of the extension to Osterley makes Madeley Road more likely.... or less likely? Or do you think TfL have been looking at it as a separate issue entirely? I personally think they were linked once the Osterley consultation was borne since they mentioned on the scheme about the separate consultation regarding Madeley Road there and that may have been the reason for the delay. I also think they’ll scrap the idea and think of other things to put the money into aside from changing what is a decent road layout at the Hanger Lane/Madeley Road Junction. If the route will require decks then it would almost certainly require regular pruning of the roads trees as well. I strongly suspect the entire idea is dead. Looking on streetview I see that Madeley Road has weight restrictions and a controlled parking zone. I suspect these plus residents' complaints about buses coming down "their" roads have killed the proposal along with the cost of modifying the A406 junction to create a bus only right hand turn. There may also be junction timing issues too as a bus turning right would interrupt a pedestrian crossing phase. This means that traffic on the A406 would be stopped for longer than now which I suspect would have come out well in the modelling even if the bus turn is only activated when a bus is waiting to turn - that's still 5 times an hour. I recall seeing comments on Twitter about the 112 extension - people generally liked the idea of more buses through South Ealing to cope with the peak time crush but hadn't properly considered the implications of what extending the 112 would likely mean for reliability. I suspect that in a moment of cold reflection TfL have realised it wasn't the best idea in the world either. The problem they have is that they don't want to extend a very high frequency service down there and possibly don't want double decks either. That leaves them with very few sensible options about what local Ealing route they could extend. I also suspect a local stand alone route is off the cards too. I've previously said the E1 seemed the most sensible option as although it's busy in the peaks it's relatively short but it's probably too much capacity for TfL to extend. There aren't really many other sensible options - the E11 is too low capacity while the E7 and E9 are pretty long routes in the own right. I've not used any of these 3 routes so I may be talking nonsense but it looks a tough ask to me. If the H28 wasn't a low capacity, very twisty and turny route then the logical thing would be to run that on from Tescos to Ealing Broadway. If I was to go into "unrestrained" mode I'd invent a new service from Chiswick, Edensor Road to Ealing Broadway via Chiswick Bridge, A205 Mortlake Road, Kew Retail Park, Kew Bridge, Brentford, Syon Lane, Gillette Corner Tesco, H91 then 65 into Ealing Broadway. I'd run it at 4 bph peaks and daytimes, 2 bph evenings and Sundays with 10.5m (or so) single deckers That gives some new local links and plugs people into a major employment for both sides of the Thames. It'll never happen though. The 112 never seemed a sensible proposal when taking into account the North Circular Road so quite thankful it was dropped as well as the re-routing via Madeley Road. 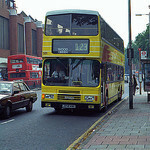 The 112 was a route I'd do regularly during my 'lazy' days at college and traffic regularly messed it up. If I was to go into "unrestrained" mode I'd invent a new service from Chiswick, Edensor Road to Ealing Broadway via Chiswick Bridge, A205 Mortlake Road, Kew Retail Park, Kew Bridge, Brentford, Syon Lane, Gillette Corner Tesco, H91 then 65 into Ealing Broadway. I'd run it at 4 bph peaks and daytimes, 2 bph evenings and Sundays with 10.5m (or so) single deckers That gives some new local links and plugs people into a major employment for both sides of the Thames. It'll never happened though. A long time since I was down there but perfectly fair comment - the A205 is pretty awful and Kew Green / Bridge is appalling. It's all a bit academic given TfL are only looking to remove buses from Chiswick, Kew and Richmond not add more of them. vjaska , I think extending the E9 seems the most likely alternative given its frequency, vehicle type and current route length. 1. Extend the E11 to Osterley and have the E10 restored to Ealing Common to replace that end of the route. This would would improve links through West Ealing and along the E1/E3 corridor, but I can’t see TfL wanting to increase frequency plus I’m not sure if the tight roads in Hanwell and Greenford can handle longer vehicles. 2. If the 427 diversion to Southall goes ahead, a new route from Acton Town Hall to Osterley using the vacated 427 stand and running via current 427 to Ealing Broadway before heading down South Ealing Road. I would be tempted to extend it beyond Acton to Chiswick Business Park, but only during hours when employees would need the service. That scenario is highly unlikely given TfL’s predilection for standardisation. Won't the 427's Acton Town Hall stand be used by the curtailed 266? Ah, yes it will. I have to admit I haven’t seen that stand for almost a decade but from what I recall it’s pretty small. Is the Acton Market Place terminus still available? H28 - Curtailed to West Middlesex Hospital, runs direct along Cranford Lane. No frequency change. 117 - Curtailed to Ashford Town Tree Road (Hopper fare for routes 216 and 290 to Staines). Extended from West Middlesex Hospital to Ealing Broadway via route H28 to Syon Lane and Osterley Tesco, then onward to Ealing via proposed 112 extension. No frequency change, vehicles changed to higher capacity single decks or deckers. This would open up many new journey possibilities that are currently incredibly difficult by bus or train plus improves links between Ealing and West Middlesex Hospital. There are none at present, even though many Ealing residents are treated there. The E8 was once mooted to run via West Middlesex Hospital, but didn’t materialise. My wacky 117 revision would do that. H28 changes and 117 cut back to Ashford would help minimise the net mileage increase from the 117 extension. Net impact on 117 running time would probably be an increase of around 10-15 minutes in the morning peak. The Market Place stand is available. However you can’t use deckers on 117 unless you divert it away from the low bridge on St Johns Road in Isleworth. You would also face stiff opposition about any change whatsoever to the H28. TfL had to shelve plans to simplify the routeing years ago and I doubt much would change this time either. The 112 is quite busy so I think they should leave it. They should extend one of the other routes to Osterley like the E11. I also think TFL should absorb the E2/E9 into one and withdraw either one. So either extend the E2 to Yeading or extend the E9 to brentford via the E2 Route. I don’t know how the E2 gets away with a 6-10 frequency. Not a bad idea to amalgamate the E2 and E9 *if* there is excess capacity along the Pitshanger Lane corridor. When I lived around that area it was busy enough to justify all those buses, especially during the peak hours. Not sure how much has changed. 55% against but still going ahead. Thank you for your interest and response to the proposals for route 112 that we consulted on between 12 October and 23 November 2016. To recap, we consulted on proposals to alter route 112 between the A406 Hanger Lane and Ealing Broadway, Haven Green so that it runs via Madeley Road, which is not currently served by a bus route. We also proposed to alter the junction of the A406 Hanger Lane and Madeley Road to allow local buses only to turn right into Madeley Road. We received 252 responses to the consultation (including 10 responses from stakeholders). Of the 241 public responses, 36 per cent supported or strongly supported the proposed changes to route 112, 3 per cent neither supported nor opposed them, 55 per cent opposed or strongly opposed them. 7 per cent did not answer. 28 per cent of respondents supported or strongly supported the proposed changes to the A406/Madeley Road junction, 12 per cent neither supported nor opposed them, while 43 per cent opposed or strongly opposed them. 18 per cent did not answer. After careful consideration of all of the consultation responses and discussions with the London Borough of Ealing, it was highlighted that the existing road surface on Madeley Road would benefit from being upgraded to be suitable for buses. The London Borough of Ealing will proceed with the design for the reconstruction of Madeley Road later this year with a view to commencing construction in early 2019. Subject to the successful completion of these reconstruction works, we will go ahead with our plans to reroute the 112 via Madeley Road and carry out the necessary associated changes to the junction of the A406 Hanger Lane and Madeley Road.